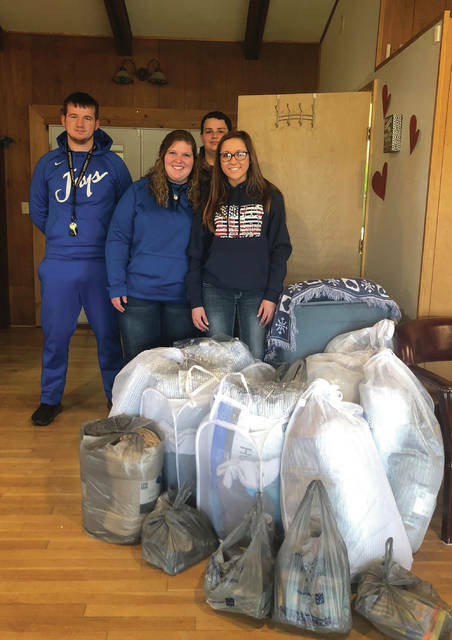 Through a Youth Service America (YSA) grant received by Shelby Schelling, agriculture education teacher and FFA advisor, the RULH High School FFA chapter recently put together care packages and donated them to the Adams County Homeless Shelter in West Union, Ohio. A total of eight care packages were delivered that included blankets, pillows, towels, wash cloths, and personal hygiene products. Some surplus items were also given to the shelter. RULH FFA Chapter President Brett Morris, Vice President Gracie O’Connor, Secretary Kaitlyn Smith, and Sentinel Alex King officially donated the items to the shelter on Tuesday, February 5, and then received a tour of the facility.